The New York Film Academy is pleased to offer 12-weekend filmmaking and acting for film camps for kids (ages 10-13) on Saturdays during the school year at our New York City and Los Angeles campuses, as well as 3D animation camps in the New York City location only. We have designed our kids weekend camps with the same high standards that we apply to our high school and university-level camps. The weekend camps offer students a unique opportunity to explore filmmaking, acting for film, or 3D animation in a supportive and professional environment. Each camp is taught by our faculty of active industry professionals, which consists of award-winning filmmakers, actors, and animators who are able to relay their extensive experience in the entertainment industry to students who are eager to learn. The camps are structured around the Academy’s philosophy of “learning by doing,” meaning that students learn filmmaking, acting for film, and 3d animation through making films, acting on camera, and animating objects and characters, from the very first day of camp. The weekend camps meet for 12 sessions on Saturdays from 10 a.m.-1 p.m. Learn more about each camp below. The Film Academy’s kids 12-weekend filmmaking camp challenges young people to tell a story with moving images. Students begin working with digital cameras from day one, learning the fundamentals of directing films. Hands-on classes in directing, writing, editing, cinematography, and production cover the creative and technical demands of telling a story with moving images. Over the course of 12 weeks, each student writes, directs, and edits his or her own short films while also filling a number of different crew positions in their fellow classmates’ own films. Students shoot on digital video cameras and learn how to compose, direct, and light for quality images, and edit using professional digital editing software. Students studying at our Los Angeles campus will have the opportunity to shoot their films on the Universal Studios backlot. Students at our New York City campus shoot both in our professional facilities and on supervised trips out into the city. Filmmaking students complete a series of short films over the course of the weekend filmmaking camp, with each project increasing in complexity. At the end of the weekend camp, the final films are celebrated in a screening open to cast, crew, friends and family. Graduates of a New York FIlm Academy 12-Weekend Filmmaking Camp or a New York Film Academy filmmaking summer camp are eligible for the 12-Weekend Filmmaking II camp. 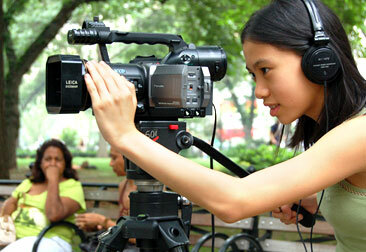 This camp offers students the opportunity to take the next creative and technical step in filmmaking. Students develop, pre-produce, and create a longer and more complex project than that completed in the initial camp. Closer attention is paid to set and costume design, locations, shot choices and coverage, as well as additional crew roles. The finished product is a film of up to five minutes. Classes focus on topics including digital cinematography, screenwriting, editing practice and aesthetics, and directing for cinema. Offered over the course of 12 Saturdays during the school year, 12-Weekend Acting for Film Camp encourages kids to pursue their acting dreams and offers experiential lessons on how to perform on a hectic film set. This camp emphasizes the basic elements of the craft of acting for film by teaching fundamental acting technique and scene study as starting points. Students participate in in-class shoots aimed specifically at training the actor for the technical requirements of acting on a film set. Every student shares the same curriculum. Some additional time may be scheduled for productions as needed. During each Saturday, students are encouraged in class and in supervised workshops to break down physical and internal inhibitions, and help them find the most effective personal sources for the creation of truthful characters. NYFA’s weekend acting camp classes are unlike most other acting classes, as they are constructed to reflect a professional film set with camera operators and professional lighting. Students develop the techniques and confidence they need to create believable performances for the camera. They apply what they learn to a series of on–camera exercises designed to develop their screen acting ability. Once the camp is completed, each student receives a digital reel with their filmed performances. The reel is professionally edited for students to share with family and friends, use in auditions, and send to prospective agents. Graduates of a New York FIlm Academy 12-Weekend Acting for Film camp or a New York Film Academy acting for film summer camp are eligible for the 12-Weekend Acting for Film II camp. Starting where they left off in the initial weekend acting for film camp, acting for film II students are cast in and explore the process of performing in a more in-depth production. Students may shoot the final project on location or in a closed set at the Film Academy. While students are introduced to specific acting techniques and exercises as they apply to acting for the camera, classes primarily focus on rehearsal and preparation for the final project. With the opportunity to write, direct, animate, and edit their own 3D-animated short films, the 12-Weekend 3D Animation Camp for kids is a creative experience like no other, offering aspiring animators unparalleled opportunities to learn the vital skills and tools of their craft hands-on. Over the course of 12 weekends in New York City, students review the history of animation and the traditional animation pipeline, also learning the foundational techniques used in modeling, texturing, and animating both characters and environments. The course focuses on storytelling through the audio-visual medium of 3D animation, using industry-standard software and latest generation Apple computers. Click here to learn more about the 12-Weekend 3D Animation Camp for Kids. The New York Film Academy’s weekend photography camp for kids is an exciting exploration of the world of digital photography. Throughout 12 consecutive Saturdays during the course of the school year, kids learn the technical and aesthetic tools of photography on digital cameras through hands-on experience both in class and in on-location shoots. Upon the successful completion of the program, students are celebrated with a graduation ceremony, including a slideshow of the students’ best 3-5 shots. All graduating campers will take home a copy of their work from the program. Click here to learn more about the dates and tuition information as well as apply online.